The Oyster 47 is the development of the successful Oyster 45, with the same proven rig and accommodation layout. Holman and Pye extended the hull and deck to allow a deep and spacious aft lazarette giving extra deck storage space. The layout of three sleeping cabins, coupled with the deck saloon concept make her one of the most desirable configurations for a couple or family looking to embark on an extended cruising voyage. Oyster Moon is an attractive yacht with a particularly smart interior. 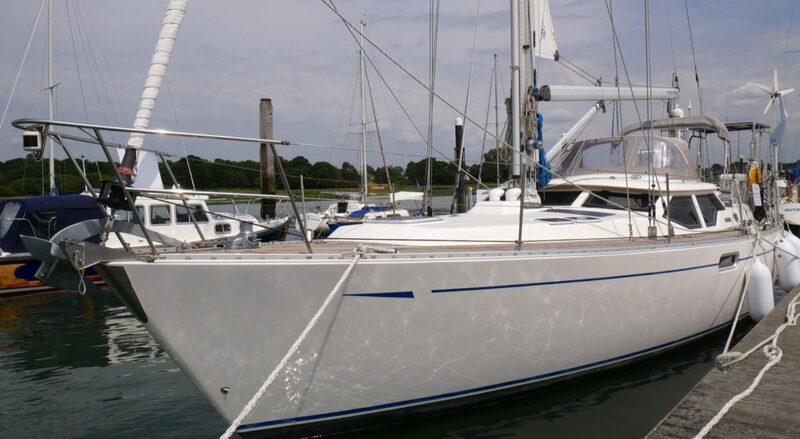 Well equipped for self sufficient and comfortable long distance passagemaking, sail handling is a breeze with in-mast furling and electric winches. 2 x Lewmar electric 58 two speed, self-tailing primary winches. 2 x Lewmar electric 44 two-speed, self-tailing coachroof winches. Sleipner 95kgf tunnel-type bow thruster, including eyebrow. 4kva Panda generator – new 2011. Stainless steel rigging – new 2011. North mainsail – new 2011. North genoa – new 2011. North storm jib – new 2011. Four solar panels and DuoGen – new 2011. 12v Spectra 380C water maker giving 64 litres per hour. Bimini with drop down sides. Additional all over sun awning. Hard-bottomed AB RIB with Honda 2.3 Honda Outboard.